After a brief nap on a very cozy bed, we decided to explore the city. London is one of the most wondrous melting pots of nationalities and cultures found anywhere in the world. At Buckingham Palace, we saw the Queen swept away in her limousine with an army of guards. Her Majesty waved to us as they passed by. A quaint custom: when the Queen is residing in Buckingham Palace, they fly a flag different than the usual “Union Jack.” When Her Majesty isn’t staying at Buckingham Palace, she’s usually at one of her two other residences, in the English countryside and in Scotland. We also wanted to see Princess Diana’s former home, Kensington Palace. It’s largely hidden in a residential area, with gates locked, along what’s known as “billionaire’s row.” We were able to see the driveway with a Rolls Royce sitting there in wait. The Palace was similar to a large mansion in the U.S. and nothing too elaborate from what we could see from the residential street. Later, we visited the National Museum of History in London. It left quite an impression and the price was right, as there’s no charge to visit any museum in London. “Jolly good show” as they’d say in Londontowne! We did some shopping and were intrigued by a quaint little shop called “Taylor’s on Old Bond Street.” They offered my husband an old-fashioned shave using a straight razor (complete with hot towels and face massage) for USD $30. Then off to other stores, and plenty of other good “buys” that caught my fancy, including exquisite little perfume bottles and cashmere gloves. (My husband considered a kilt with a tuxedo top, although he already has two kilts.) Splendid little restaurants were everywhere, and we had “high tea” and scones that afternoon in one of them. The quaint formality of the experience was a joy – we almost expected “Prince Charlie,” as the cabbies call him, to stroll into our restaurant at any moment. On our way to these shops, we passed the 5-star “Mandarin Hotel” packed with reporters and paparazzi clearly awaiting the arrival of someone very famous. Was it Her Majesty? Our cruise ship departed from Southampton, about 90 minutes south of London. We were told to allow two and a half hours for the drive, but light traffic and our rented BMW made short work of the trip. This allowed us extra time to digress through the suburban countryside of Southampton before heading to the port. The country homes had the same charm reminiscent of those in London, but more spacious size and lots. 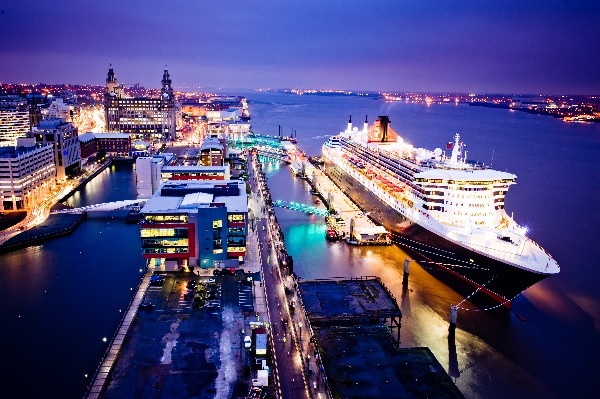 Entering the port, our gaze was irresistibly drawn to the Queen Mary 2. It is simply awe-inspiring, even for the veteran cruiser. 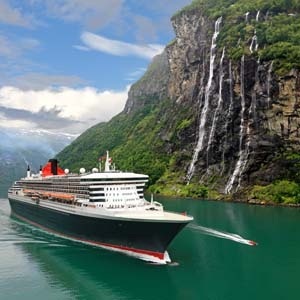 The QM2 is the largest, longest, tallest, widest and most expensive cruise ship afloat today – a blessing given that the high Atlantic seas can be a little choppy this time of year! At 14 stories tall, the ship sports a black hull, a bright red-and-black smokestack, with everything else painted white. 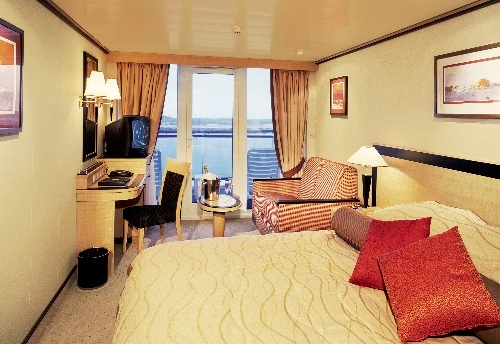 We made our way on board and found our cheerful, immaculate cabin with our luggage already delivered. It was technically a B3 class cabin (a lovely room) that included a very private hull balcony. Halfway through the cruise we upgraded to a Q4 cabin, how could we sell this cabin without experience? This spectacular suite had amenities such as a deep, oversized whirlpool bath, a private butler and a private dining room. So this is what it feels like to be part of the Royal Family¦. Our first dinner on board was at the Todd English restaurant, named after a famous chef known for Mediterranean cuisine. A small surcharge as part of this private-dining experience was more than offset by the exceptional cuisine and presentation of our meals. (We heartily recommend the beef tenderloin, and our sommelier showed good instincts with an excellent Chateau Segur Bedoc, 1999 vintage.) The piece de resistance of our meal was a warm chocolate torte, the inside of which flowed out the moment our forks touched the desert – chocolate paradise! A champagne party was also taking place outside the restaurant and we sauntered out for a few moments between courses to view the lovely skyline we were leaving behind in Southampton. Cruises are known for their world-class dining opportunities and the QM2 lifts this reputation to a truly new level with stellar cuisine for breakfast, lunch and dinner, plus tea time on the British ship. My husband enjoyed caviar with nearly every meal – he seemed to think he could get used to it on an ongoing basis. We discovered there are three main common dining areas on the ship. Where you dine depends on your status, i.e., price of your cabin. Because of our cabin change, we received a special invitation to the Queen’s Grille, typically designated for those staying in suites and the premium-class apartments. Guests in junior suites typically dine in the Princess Grille, while balcony-class and stateroom guests eat in the Britannia Room, featuring a breathtaking three-story grand staircase. This area seemed especially “alive” with people who really seemed to be enjoying themselves and their companions. We dined in all three of the common dining areas and can report that the food is comparable in each. To be sure, there were subtle differences in the amenities offered by each, but diners will be more than pleased with their experiences wherever they dine on board. The ornate settings, lamps and strategically placed art featured in the dining areas and throughout the ship contributed to the aura of being a part of a bygone era. I opted for a massage and fell into a blissful sleep halfway through the experience. After that, it was time for the thalassotherapy pool – in essence, a giant whirlpool bath complete with “deluge” waterfall (just like it sounds) and hot tub. We visited the thermal suite with herbal and Finnish saunas and decompressed further in the aromatic steam room. Ah, the relaxation: was I dozing, or was that really Prime Minister Tony Blair sitting next to me? Never ones to miss an opportunity to shop, we spent time today perusing the QM2 shopping district. The mix of boutiques was guaranteed to accommodate every elegant taste, whether you’re in the market for jewelry, fine clothing and the like from luxury retailers such as Hermes. We were thrilled to get a “deal” on a pair of pink diamond earrings and a silver-and-gold bracelet. All items are duty-free (no taxes) and Cunard will pay any shipping/taxes anywhere in the world for purchases you’d prefer not to carry. We decided to take a break from luxurious living today and experience the QM2 enrichment and lecture programs. No matter what your passion, there surely is something for everyone to expand educational horizons during this cruise. We started with a “Chefs at Sea” demonstration filled with culinary tips – do you know how to make Crepes Suzette? I didn’t. Later, we enjoyed a lecture part of the Cunard ConneXions program. ConneXions provides guests with the chance to meet a variety of eminent personalities from around the world invited on board to share their literary and academic experiences. Other enrichment opportunities include Oxford Discovery, Cunard’s unique “academy at sea” seminar series hosted by professors from the prestigious University of Oxford. Special readings and architectural design and horticultural workshops are hosted by editors of The New Yorker, Architectural Digest and House & Garden magazines, among others. From the moment we stepped on board the QM2, one of the first things we noticed were the many pieces of art on display in the public areas of the ship, as well as its art gallery. No matter what your artistic tastes, there seemed to be something for everyone. Our personal butler told us that more than 300 international artists were commissioned to produce original works for the ship, valued in excess of USD $5 million. My husband also snuck away for a while today to check out the Maritime Quest Exhibit on board that takes one back to the golden era of ocean cruising. “Not to be missed,” he assured me. We decided to spend an unstructured day, with nothing scheduled (or “winging it,” as it were.) With the weather in the 70s (Fahrenheit) we decided to enjoy both the indoor and outdoor pools situated on three QM2 decks. I counted at least seven hot tubs (we can speak for enjoying five of them.) I finished the book I was reading and visited the ship’s well-stocked bookstore for another title to tide me over (no pun intended) on the way home. If you’re disinclined to accumulate your reading material out-of-pocket, note that the QM2 also features the cruise industry’s largest floating library. Later in the afternoon, we enjoyed the view from our balcony and played a very spirited game of Monopoly before packing our bags for our upcoming arrival in the “Big Apple. Around 5 am we were up on deck, (surprised so many were up early) to view the breathtaking skyline as the ship entered the port of New York. The Statue of Liberty, truly an awe inspiring sight, a view that has encouraged the millions who have come to the USA to make this their new home. Plenty of cabs and drivers await those departing to take them to the city or airport. We opted for a quick trip to the city and this ends my little diary of a very glamorous and wonderful trip. What a feeling to have been a part of a history-making voyage aboard the Queen Mary 2. The Wedgwood China and Waterford Crystal are extremely beautiful. 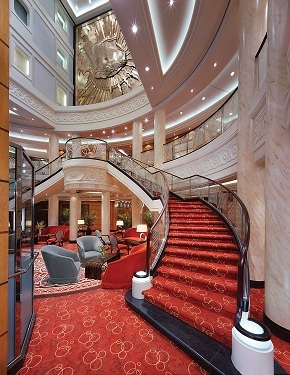 Cunard did not miss a thing in designing the dining rooms. Breathtaking heights, small lamps, pieces of art strategically placed throughout the dining areas – you do feel part of a bygone era when people had time to sit and watch life go by. Extremely nice laundry rooms with soap provided – no charge for anything in these cute launderettes. What Will We Do for Six Days at Sea? If you are worried about what you will do for 6 days at sea, worry not. I sat and watched the wave’s hit the ship from a hallway with window seats and little chairs scattered about. Almost each evening we were late for dinner as there were so many things to do. From lectures given by learned Oxford Professors to accomplished physicians to art exhibits from some of the masters (the art on the ship is museum quality) to Latin dancing, we could not fit in everything we wanted to do. There were certainly a few, yet this is probably not the type of cruise for little ones. But this would be a fabulous ship for a Caribbean cruise for the entire family. Our cruise was from London to New York. The guests list was diverse with people from all around the world and all were extremely friendly, as was the more-than competent crew. The weather at sea changed drastically. The first day it was quite chilly and then the second day it was at least 72 degrees Fahrenheit. Just a quick note that Taylors is not in Old Bond Street but in Jermyn Street, just in case any of your readers go looking for a shave on Old Bond Street where they are more likely to get scalped buy the staff in one of the Jewellery Boutiques. What you refer to as the National History Museum, is the Natural History Museum, located in South Kensington. There is currently no Mandarin Hotel in London. I presume you are referring to the Mandarin Oriental Hyde Park Hotel. To say that all museums in London charge is misleading – most ‘national’ (i.e., museums sponsored by the Department of Media, Culture and Sport) have been free in the United Kingdom since 2001 – three notable museums in London which charge admission are the Royal Observatory in Greenwich, the Design Museum and the London Transport Museum. Other than these rather fundamental errors, I quite liked your blog about the QM2… assuming it’s accurate!